Why we love GIMP? We love GIMP because it is a free alternative to Adobe Photoshop and comes with a pack of features, which are enough for a blogger or a person with similar interest. If you use GIMP, there are a ton of shortcuts you can use to do your work quickly and easily. The keyboard shortcuts cover everything from switching tools to working with layers and navigating the program. Some of the most useful ones include repeat last filter (Ctrl + F), go to the Crop and Resize tool (Shift + C), and Save image as (Shift + Ctrl + S). Of course, that depends on your workflow, but any way you slice it, this is a handy resource for GIMP users. 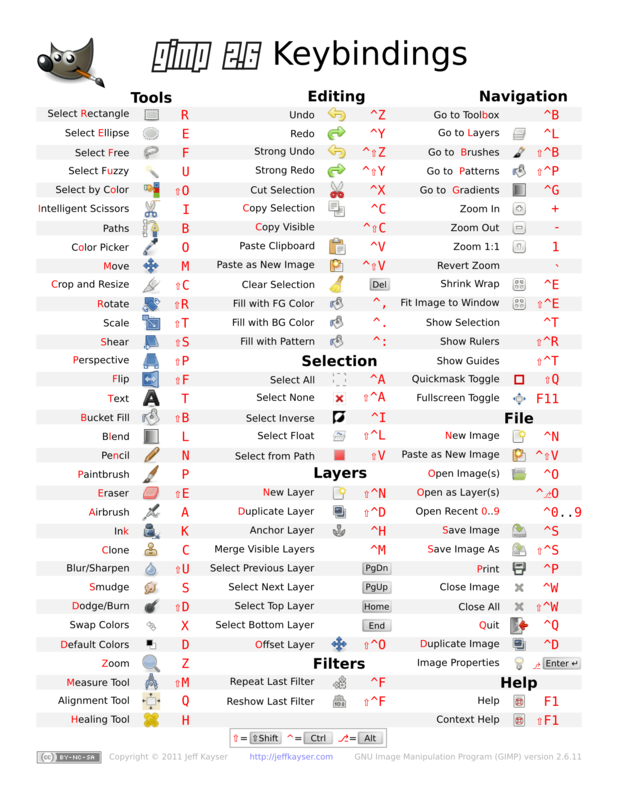 Jeff Kayser created it for Gimp 2.6, but the shortcuts seem to still be the same for the latest version of Gimp (2.8). Details of what you can do with GIMP without buying Photoshop are available here.